Anything that gives me game before 6 mana and isn't blank when it's flipped up with Mayael is worth consideration from me, at least. Three Visits and Farseek aren't really threats either. First creature I've considered in a while. If Kiki could target it, it would be. The legendary bit on Etali puts a damper on any typical clone shenanigans. ~ Rhys the Redeemed - Tokens... Why do they keep coming!? Wayword Swordtooth could replace Oracle of Mul Daya. But I probably won't. I like being able to play lands from the top of my deck. There's also Zacama. But, I'm not a fan of abilities that require mana because they take away from mana I would otherwise use to activate Mayael. 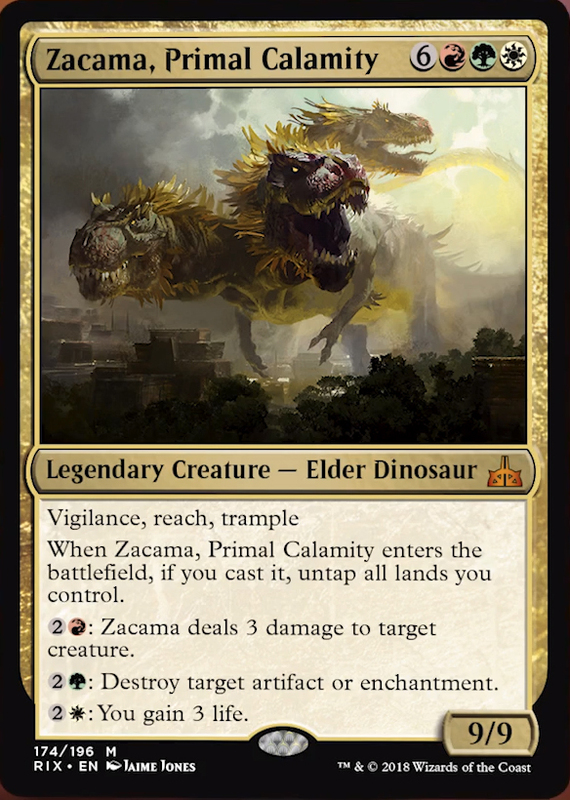 @ Zacarma, Primal Calamity: Mostly I don't like the mana cost: there's very little I want to pay that much for. I don't mind having a few alternatives to activating Mayael and sometimes these will definitely be better than what she could dig up. I wouldn't play it, but a build geared more towards getting large amounts of mana out might, especially as you'll be more likely to activate both it and Mayael. 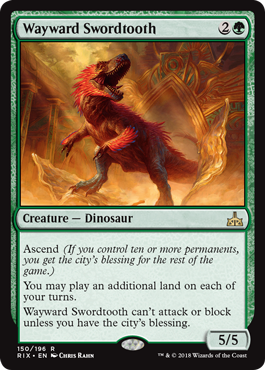 @Wayward Swordtooth: can't really see playing this, playing an extra land is just not all that important to me. @TheDoctor: Oops: I missed that. Probably only worth it if you have several reusable graveyard hate cards like Relic of Progenitus, Scrabbling Claws, Phyrexian Furnace or Scavenging Ooze. That, or if you don't run many (or any) creatures that aren't Mayael targets. If your worst dead fatty is better than your opponents' worst dead creature, you're still getting value. Dawnbreak Reclaimer might just be good enough, looking at it again after awhile. I would probably want a little more graveyard hate, but worst case scenario, you can just say no- -you and your opponent choose, then you decide the 'may' part of the trigger. Seems like it'd be useful in political situations. 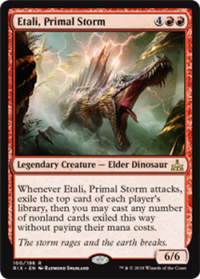 Etali, Primal Storm is pretty damn sick with a deck chock-full of top-of-the-library manipulation. Any card you get from an opponent is a bonus, but casting your own spells is like getting an extra Mayael hit each combat (except sometimes you get free Warstorm Surges or Greater Goods). Is Mayael still relevant in a world with Gishath, Sun's Avatar? You shut your mouth. You shut it real good. I kinda think it will take at least one more trip to Ixalan before Gishath has the card quality I would prefer. I did build that when Rivals came out, and you just had to run a lot of terrible dinos.